Welcome Sarah Darer Littman to this stop on the Summer Blog Blast Tour! Sarah Darer Littman is the author of the middle grade and young adult novels: Confessions of a Closet Catholic (Dutton Juvenile, 2005) (my review); Purge (Scholastic, 2009), and the upcoming Life, After (Scholastic, July 2010). Her blog, It's My Life and I'll Bog If I Want To. Liz B: You have a new book, LIFE, AFTER coming out this July. Can you tell us about LIFE, AFTER? Sarah Darer Littman: I like to think of LIFE, AFTER as my “phoenix out of the ashes” book – for several reasons. Firstly the concept came about in a convoluted way from another book proposal that was rejected. I started working on it about five or six years ago but I couldn’t get the voice right, so I put it in a drawer, where it might have stayed if I hadn’t met someone who asked me if I’d ever considered writing anything for teens about 9/11 – she’d lost her husband on Flight United 93 and she said there wasn’t much for kids on the subject. I sent her the synopsis I’d written and she told me I should write the book. My editors at Scholastic were on board, and I found that having met Claudette, and listened to her experiences, I was able to connect with my characters better and I returned to the story with renewed passion. Life, After is dedicated to Claudette, because without her encouragement, the story would probably still be sitting in a drawer. LIFE, AFTER tells the story of Daniela Bensimon, an Argentinean teenager whose family life is crumbling under the weight of the country’s 2001 economic collapse. When they emigrate to the U.S. hoping for a fresh start, Dani finds life in America isn’t all it’s cracked up to be. She misses her old friends, her life, Before. In addition, she must deal with an angry, depressed, father who seems more like a stranger every day. Just when Dani is about to break, she meets a boy named Jon, who isn’t like all the other students. Through him, she becomes friends with Jessica, one of the popular girls, who is harboring a secret of her own. And then there’s Brian Harrison, the boy who makes Dani’s pulse race. In her new life, the one After, Dani learns how to heal and forgive. She finds the courage to say goodbye and allows herself to love and be loved again. One of the best comments I got from my teenage daughter was when she asked: “How come there are no Brian Harrisons at my school?” I hope other readers like him just as much. Liz B: In LIFE, AFTER, Dani is an Argentinean immigrant to the United States. What type of research went into creating Dani? Sarah Darer Littman: I’ve never been to Argentina, so I had to do a LOT of research. I read many, many books – everything from tour guides of Buenos Aires to books about the “disappearances” under the military dictatorship, even though these occurred before the time period of my story. For my major revision of the first third of the book, my editors asked me for “more color” of life in Buenos Aires. I used Google maps to figure out exactly where Dani lived and what park she went to with Roberto, and then found pictures of those streets and the park so I could visualize them as I did the revision. And how cool is this? The city of Buenos Aires has this database where you can look up exactly what species of trees are on each street! I did take one liberty by putting an Ombu tree in a park where there isn’t one in real life, because I’d fallen in love with that tree in the first draft. Ironically, while I was in one of the many revisions of LIFE, AFTER, the scandal broke about South Caroline governor Mark Sanford, who disappeared suddenly without notifying his office staff, allegedly for “book research”. It later transpired he was visiting his “soul mate” (a.k.a “mistress”) in Buenos Aires. I was so jealous because I really NEEDED to go to Buenos Aires for book research, but it wasn’t in my budget! Liz B: CONFESSIONS OF A CLOSET CATHOLIC, your first book, was published in 2005. How has publishing changed in the past five years? Sarah Darer Littman: Publishers are even more cautious about acquiring new projects. And the publicity dollars for the projects they do take on are tighter. It’s always been a struggle to get your book noticed if you aren’t THE BOOK that the publisher is putting the money behind on the list, but I think these days even more so it’s up to the author to be creative about marketing oneself and one’s books. For a lot of us that doesn’t come naturally, and it takes a mental shift from the type of energy that you need to sit for hours in your basement alone working on a manuscript. I recently started a part-time job working at the Voracious Reader bookstore in Larchmont, NY. With school budgets being cut, reducing the likelihood of building up a steady stream of school visit income, I’m trying to be realistic about making this all work. Shannon Hale wrote a great blog post recently describing the challenges of supporting oneself as an author. You read it and think, “Holy C^%^&p! This is SHANNON HALE! If she can’t make a go of it, how the heck am *I* going to survive?” But I spent so many years working in finance that paid way better but where I was the proverbial square peg in a round hole, that I’m willing to do whatever it takes to let me keep writing books and doing the things I’m passionate about. Working in an indie bookstore is great because I see another side of the publishing industry and I’m surrounded by books and people who love them all day. Plus, I just got to sell a customer one of my books and then offer to sign it for her, which was very cool! 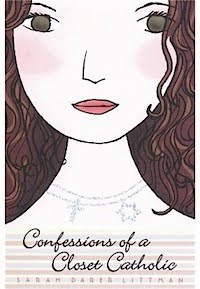 Liz B: CONFESSIONS OF A CLOSET CATHOLIC was one of the first books I reviewed on my blog. It beautifully addresses questions of faith and religion and family. What do you think of how faith is handled in today’s children’s and young adult books? Sarah Darer Littman: I think it’s great when authors are able to integrate faith into a story without it becoming a didactic, pound kids over the head, THOU SHALT BELIEVE affair. For many young people, faith is an important part of their lives and to be able to identify with characters in a book is empowering. But it’s just as important for kids growing up in more homogeneous communities to be able to read about young people growing up with different beliefs, so that they can develop respect and tolerance. I did a NY Teen Author Week event in March with Neesha Meminger, who read a passage from her novel Shine, Coconut Moon . There was a turbaned Sikh boy in the audience, and as she read a passage about the prejudice experienced by Sikhs post-9/11, his face lit up because he was hearing a novel that spoke to his experience. Liz B: Social media is expected of authors today. You’ve been online for years, and your online self reflects you as a whole: you write about politics, about your family, and, of course, about writing. What is your advice to other writers who have, or are encouraged to have, an online persona? Sarah Darer Littman: First of all, don’t be “encouraged” into doing anything that you don’t feel comfortable with or doesn’t come naturally to you, because it will show - and that will end up defeating the object of having an online persona, i.e. if the one you have appears uncomfortable and stilted, or if you only post to your blog once every three months. Face it, not everyone is a Maureen Johnson or a John Green. You’re better off figuring out your strengths and applying your time and energy in those areas. I have adjusted my online presence somewhat since I started. I used to blog about everything all on the same blog, but then someone commented that she stopped following me because she didn’t want her followers to be put off by my political views. That gave me pause, and I realized that I didn’t want to alienate potential readers either, so I ended up splitting my blogs. I had a competition to think of the name for the new blog (won by Little Willow) and now I try to keep my political columnist life and my author life as separate as possible. I have even have two twitter feeds, one for author stuff and one for political stuff. It does get mixed up on Facebook, however. That’s why I just started a new author page on Facebook. I’m having a contest now to try to publicize it. Anyone who blogs or tweets about it gets an entry (2 entries if you blog AND Tweet – just email or DM me with the links). I’ll be giving away two copies of the new PURGE paperback – both of my kids will get to choose randomly from the entries, that way I will avoid WWIII. 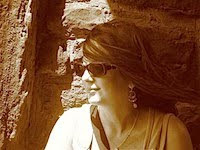 Sarah Darer Littman: I’m doing revisions of my July 2011 novel, WANT TO GO PRIVATE? about a high school freshman who becomes involved with an Internet predator. The research for this book was fascinating and deeply horrifying. I worked with my local FBI office and a contact at Greenwich Police Department and I have tremendous admiration for the people who work in the cyber crimes division. I really don’t know how they do it and stay sane. But I’m very excited about this book and look forward to getting out to speak in schools about Internet Safety. I’m also about halfway through a first draft of an as yet-untitled new book, about a WASPy kid from Darien who becomes haunted by an elderly Yiddish speaking ghost. Liz B: What is your writing process? Sarah Darer Littman: My process has been different for each of my books, but in general I’m more of a “pantser” than a plotter. With some books I read a great deal for research before I write a single word. With others, I dive right in because the voice is speaking so loudly and clearly in my head that I need to start writing right away or risk being carted off to the funny farm. Then I’ll find the characters have lead me to places that require me to do research, so I’ll have to take a break from writing and start doing some intensive reading. That’s what happened with my current WIP. I got struck with this idea and ran with it for about 15-20K words and then found that one of the characters had led me to a place I hadn’t really expected. Now I’m doing some intensive research along that theme which is very exciting, and I’ll let that mull while I do the revisions on WTGP. One thing that IS consistent about my writing process is that it always involves high octane (85%) dark chocolate. And coffee. Liz B: What were your favorite books when you were a teen? Sarah Darer Littman: OMG, I hate favorite book questions. So many books. So many favorites! I’m so OOOOOOOOOLD, as my teen daughter would say, that there really wasn’t much in the way of YA, so I went straight to adult books. I was a major historical fiction geek. I read all of Jean Plaidy’s books, loved Mila 18 by Leon Uris, went through an Ayn Rand phase ( preferred Atlas Shrugged to The Fountainhead ) and enjoyed random stuff like The Electric Kool-Aid Acid Test by Tom Wolfe. Oh, and of course I read The Lord of the Rings trilogy. I think teens are really lucky that there are so many great YA books. I love YA because it’s literature without the bull. Liz B: I LOVED Jean Plaidy as a teen. Note to self: must reread. What are your favorite teen books today? Sarah Darer Littman: Aaah, more favorite questions! Are you trying to kill me?! I just finished reading Split by Swati Avasthi and she’s definitely a new writer to watch. It’s a powerful story with fantastic voice about a teen trying to escape, both physically and mentally, from domestic abuse in his family. A Bottle in the Gaza Sea by Valerie Zenatti was one that I think didn’t get nearly enough attention. It won the 2009 Sydney Taylor Award for Teens. It’s a beautifully written book telling the story of the relationship between an Israeli girl and a Palestinian boy who have never met; their only communication is through the initial letter that Tal, the girl throws into the Gaza Sea and subsequent e-mails. Their search for understanding is powerful and illuminating. Liz B: Thanks so much! Please go over to Chasing Ray for today's round up of quotes from interviews and links to interviews. I really want to read Confessions, because I'd like to write a book that integrates faith w/o that didactic head-pounding. Well done, Ms. Littman! Can I just say she's been particularly gifted in her covers? Gorgeous! When I read that piece by Shannon Hale, I, too, was like, "Oh, well, crap then, I'll never make it." But I agree with doing whatever it takes to keep writing -- I see junior college creative writing courses in my future! Thanks for a good interview, Liz. This is a fabulous interview Liz! Thanks so much for it. And I especially found her answer on social media to be interesting - I think that answer would be worth a lot to authors who are still trying to figure out what the whole blogsphere thing is about and if it matters (and how to navigate it). I hope they find their way over here and see what Sarah has to say. 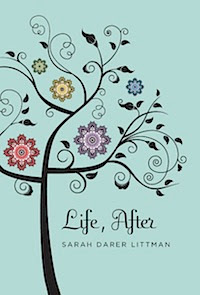 Love the cover of LIFE, AFTER! Great interview. I especially liked hearing the story of Life, After -- the stalls and the coming back and the research -- and look forward to reading it. Congratulations, Sarah, and Liz, thank you! I loved Confessions of a Closet Catholic. The cover of Life After is beautiful. I have to say, the range of books written by Sarah is dazzling! We went from an Argentinean teenager to an elderly Yiddish-speaking ghost! Great interview and now I have another author to add to my TBR list. I never really thought about it before but it makes sense that indie stores wouldn't be chuffed if authors link to Amazon because they can undercut them...but UK readers need somewhere to buy from and I don't know of an equivalent to indiebound that caters for British shops. What would you link to then - maybe the Book Depository with it's free shipping? Jodie - I think I just read somewhere that Indiebound has been set up or is about to be set up in the UK. On the other hand, I'm middle aged and I could just be going senile. "I love YA because it's literature without the bull." What an amazing quote--that made my day. :) Makes me even happier to be a YA writer! Also, I love that sepia-toned photo--very cool. Thanks for an excellent interview! Wonderful interview! Sounds like they are great reads. It is amazing that Sarah's daughter is reading her books. She sounds like a cool writer to me.